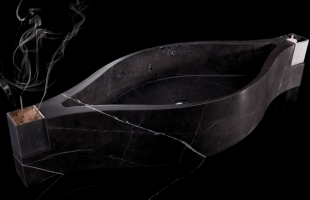 When it seem to you that all that could have been created, have been created, than the lava stone sink comes to light. 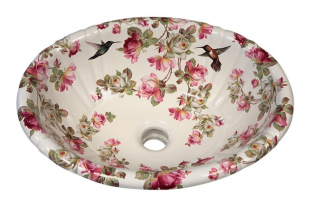 Ukrainian designers go beyond expectations with their Iceberg sink. 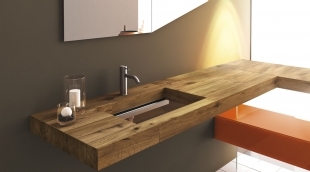 Discover stone, bronze, bamboo, copper, iron and hardwoods sinks. 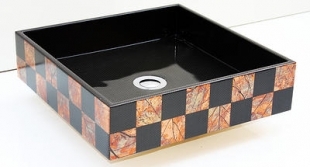 Looking for something unique and particular - check out sinks painted by Lynne Sands. 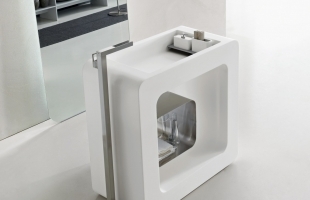 Create a bathroom island with cube vanity basin. 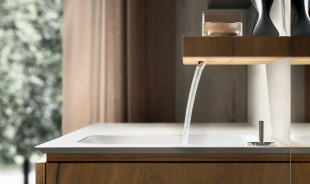 Fall in love with Italian design. 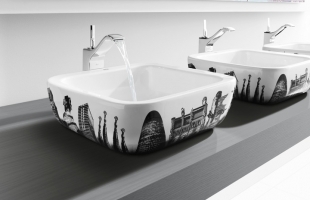 Discover sinks which present some of the world famous cities and leave a lasting memory. 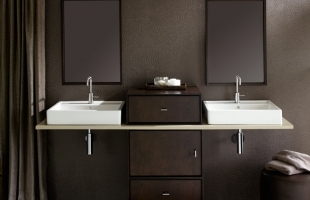 Master bathroom with 2 sinks? 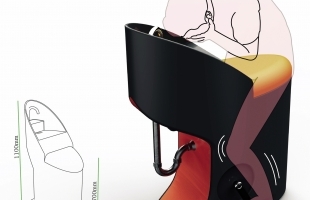 Practicality and modernity in one! 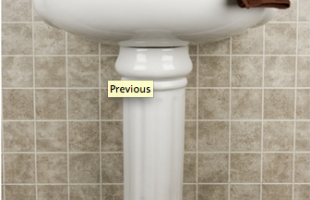 Put a bucket in a bathroom! 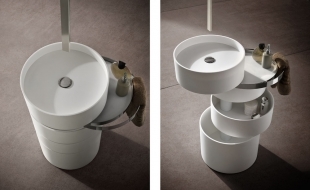 Bathroom basin in a shape of a bucket, breaking the conventionality. 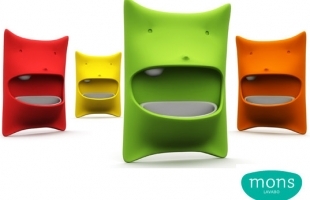 MaestroBath is a company which definitely has its fans among sophisticated clients. 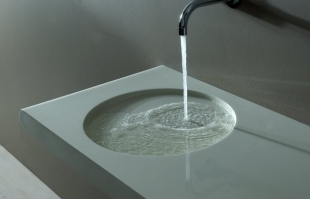 Get a sink which will let you be creative! 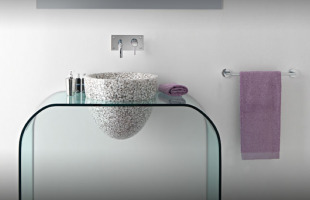 Add some colour and uniqueness to your bathroom thanks to the pebble sink. 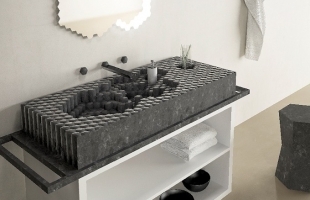 Wire sink in the bathroom - why not? Coffee Cups in the bathroom? - Why not! 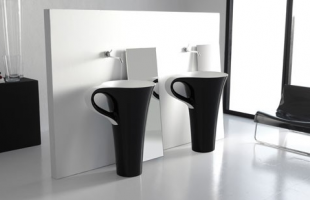 Freestanding bathroom sinks in a shape of coffee cups from Art Cream. 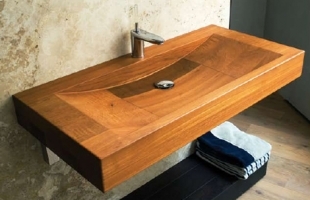 Dreaming of a wooden sink? 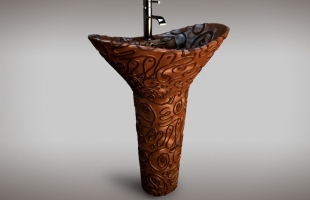 Bubinga Wood Design definitely has one which will suit you! 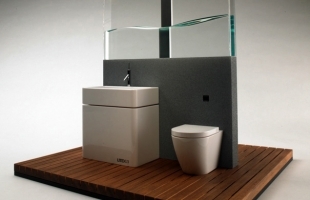 Recently Eco bathroom systems conquer hearts of nature lover. 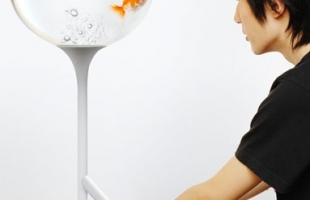 Will Jang Wooseok’s design be catch on in the bathroom world? 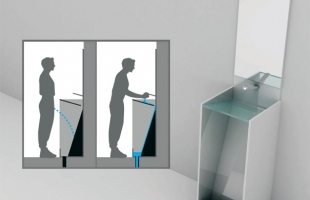 Mons Lavabo - kid-sized sink to help little ones acquire hand washing habits. While decorating homes nowadays people look not only at the practicality of a certian thing but as well at the uniqueness and style. That is why the Obit Sink got on the “wanted” list of many buyers. 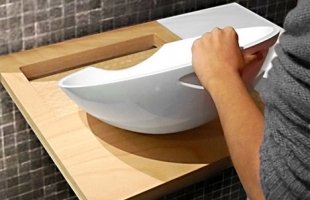 Bowl instead of a basin? 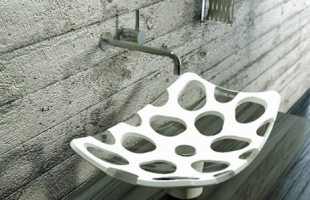 Will this drainless sink find a permanent place in bathrooms? 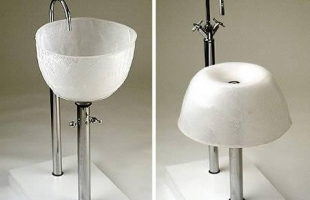 Say “WOW!” while taking a look at this unusual, yet functional sink. 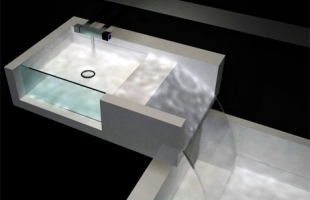 If small bathroom is your never ending nightmare take a look at shocking but at the same time amazing Pixel which will equip your bathroom without taking up space! 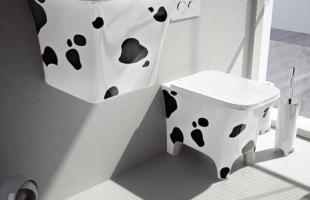 Everyone ready for a change in their bathroom should consider new collection by Meneghello Paolelli Associati on quattro zampe (four legs). 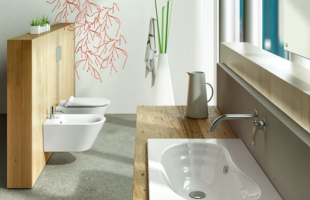 Family Basin by VitrA connects fashion, function and smart design serving therefore the whole family. 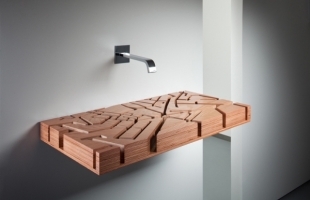 Personalized cascading waterfall for everyone's bathroom. 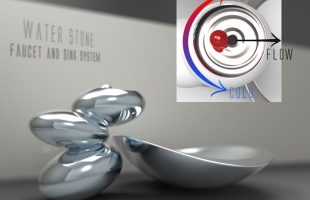 The latest tendency in development of new and unique bathroom sinks and faucet is concerned about the natural environment. 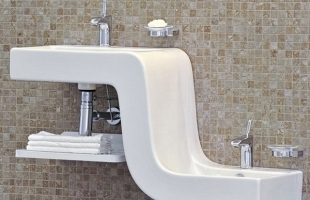 In recent years, manufacturers of sanitary ware items surprise us with more unique design. Nowadays everything impossible becomes possible. 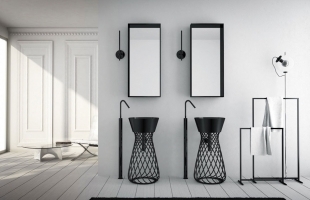 Now you can find the most unique accessorizes for decoration of you flat. 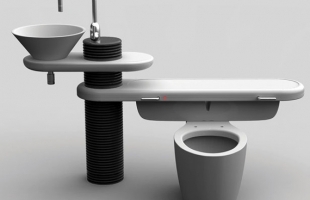 Design by Yeangwoo Kim, young Korean designer, Eco Urinal combines both – sink and urinal into one facility. 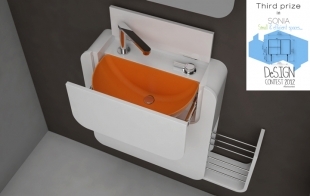 Split sink by EMO design is a creation that will definitely satisfy owners of tiny bathrooms or little apartments. 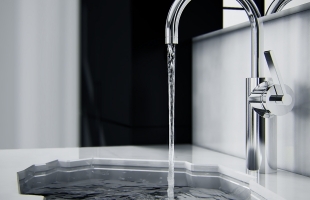 Appreciate water with Bisynk innovation! 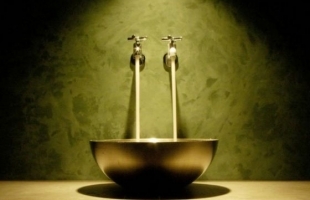 Has anyone ever thought how lucky we are to have a clean running water at home? 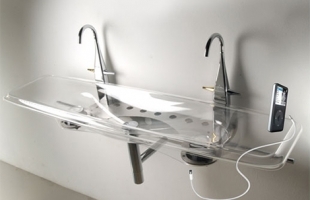 The world's first musical sink! 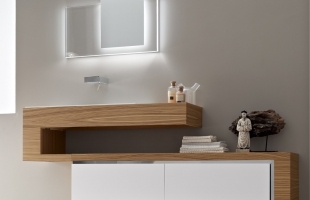 Jan Puylaert brings music to your sinks with his X-Light Surround basin. 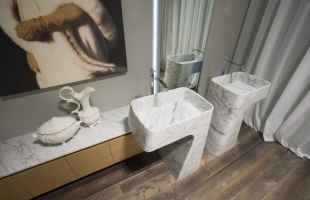 Antonio Lupi Design is a company based in Tuscan that has gained an outstanding reputation in design and bathroom furniture manufacturing in Italy and abroad as well. 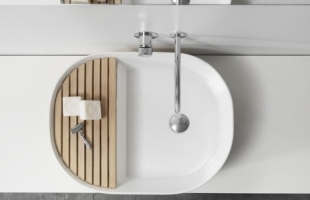 Note Design Studio has introduced a porcelain sink “Step” enriched with a wood deck on the side. 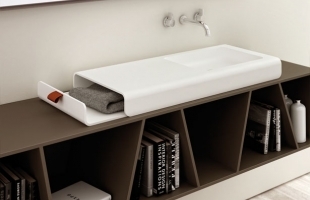 Porcher has released its newest collection the Porcher Solutions designed especially for small and unique spaces. 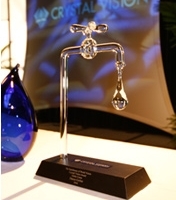 Manufacturer Partner of the Year Award wen to American Standard Brands for developing a WaterSense labeled toilet. 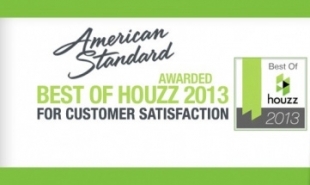 At the beginning of 2013 American Standard has been honored to wear “Best of Houzz” Bedge for Costumer Satisfaction category! 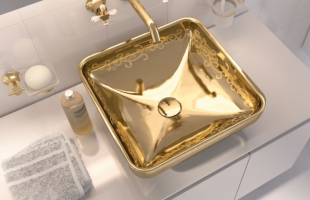 Kingston Brass releases three new collections. 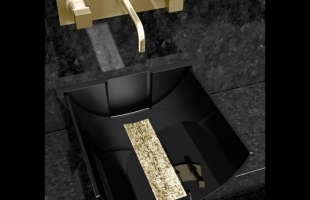 On January April 19-21, 2013 Kingston Brass will be taking part in the 2013 Kitchen and Batch Industry Show (KBIS) at the Ernest N. Morial Convention Center in New Orleans, Louisiana. 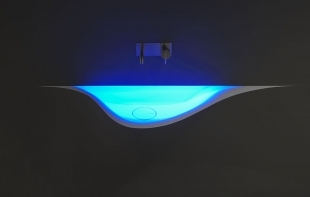 American Standard has received Gold Award for the FunBath in the Awards for Design Excellence competition. 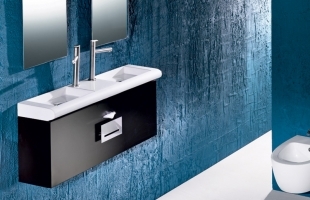 One of the widely known and reputable manufacturer of sanitary ware, has received a Crystal Vision.On May 22, 2012 World Vision (international aid organization) has awarded Kohler Co. with their annal Crystal Vision Award. 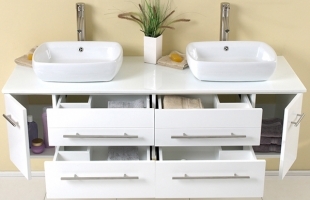 What is going to be trendy and fashionable when it comes to bathroom in 2013? 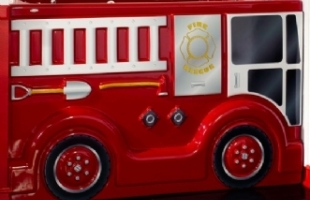 What to change, what accents to add? 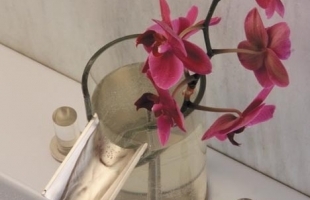 What will enhance your bathroom the most? 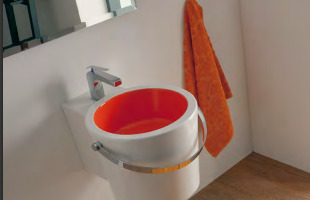 New surprising colors and bathroom sinks. 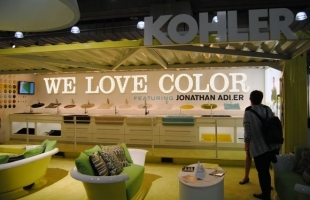 Johnatan Adler renowned designer features new vibrant and bold colors for Kohler bathroom sinks.